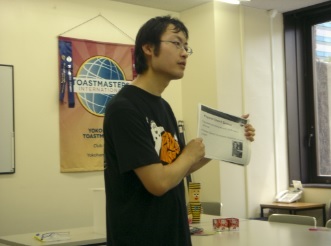 The 552th YTMC regular meeting was held on Jul. 20th. This time, TM E.Y and TM M.H had double role. Thank you for their cooperation! And we had very many guests(How 8 persons!) at this meeting. I was very surprised and happy. 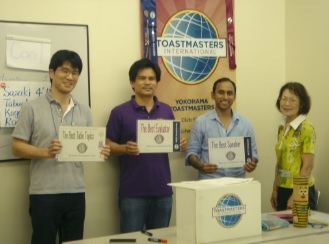 Additionally, the first time VPE TM R.K conducted YTMC briefing session for new members before regular meeting. It was nice challenge. I hope this session is continued. By the way, here is my question! What is a good speech? Next time, we will find the answer here. Fortunately, all members have a chance to hear it. Don’t miss this big invaluable opportunity!! 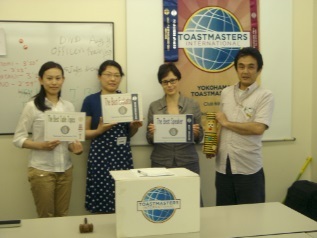 The 551th YTMC regular meeting was held on Jul. 6th. 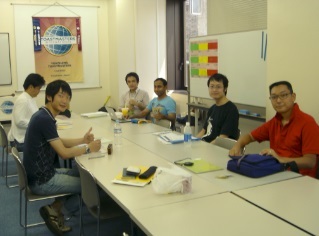 It was the first meeting during 2013-2014 terms. There were 4 prepared speakers on this meeting. And 3rd speaker, TM H.S’s song and action were so fun! 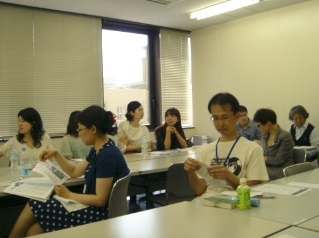 In addition, we had many members and guests at this meeting. It was very active. By the way, I have a big information. August 3rd, fortunately, the Champion will visit YTMC!! Please check the flyer for details. Don’t miss this wonderful, invaluable opportunity!